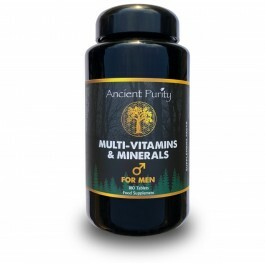 Premium Multi-Vitamin & Minerals, designed to Ancient Purity requirements. Super-dose tablets, with science-based combinations packed into each tablet, meaning light servings of tablets. Stored in the highest quality Miron Glass canister, for your further use. Mirons enhancing abilities to what is now what we feel the most advanced Multi-Vitamin & Mineral option there is. Welcome to what we feel is a complete health package to join your everyday life. At Ancient Purity, we only want to provide our products to people living a healthy lifestyle, whether you are starting from this order, started yesterday or have been for the last 100 years. 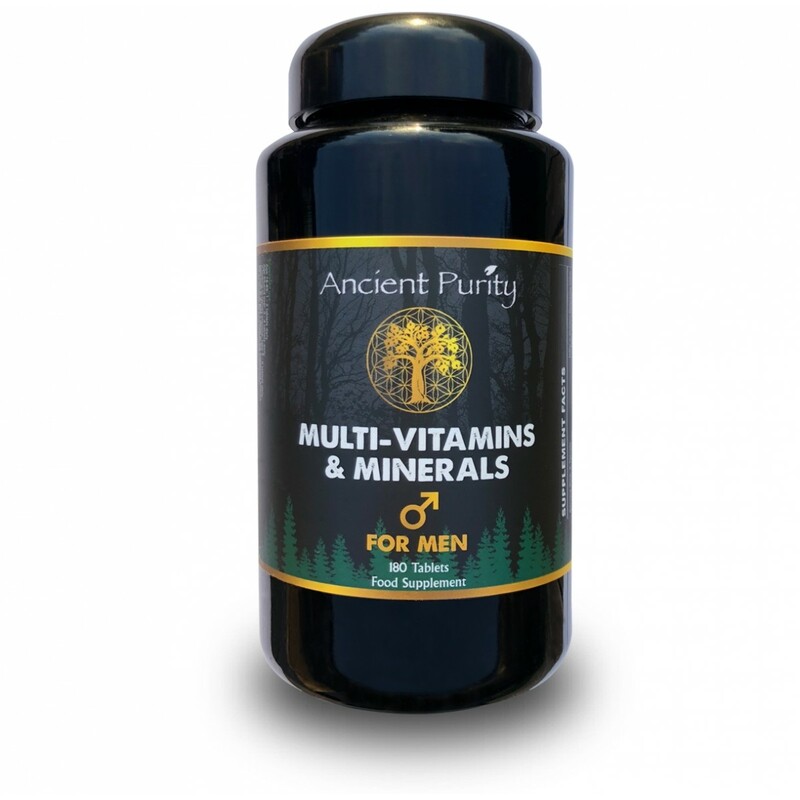 We only want to enhance your inherent good health and happiness, and that is what this Premier Multi was made for... To compliment your Health and Longevity Now. With correct nutrition, exercise and using your mind to help you rather than hinder you. This Multi-Vitamin and Mineral collection is part of your perfect state design. Of course first should be nutrition from the ideal organic diet for you, however, today is that possible, do you have an organic biodynamic farm near you, are you growing/farming food organically yourself or purchasing locally. If like most you are not then we are offering an option to help your perfect state of health with this product. Full Spectrum Nutrition: Vitamins, Minerals and cofactors. Extensive Directions for a Man based on size and age. Complimentary to the Healthiest Lifestyle. 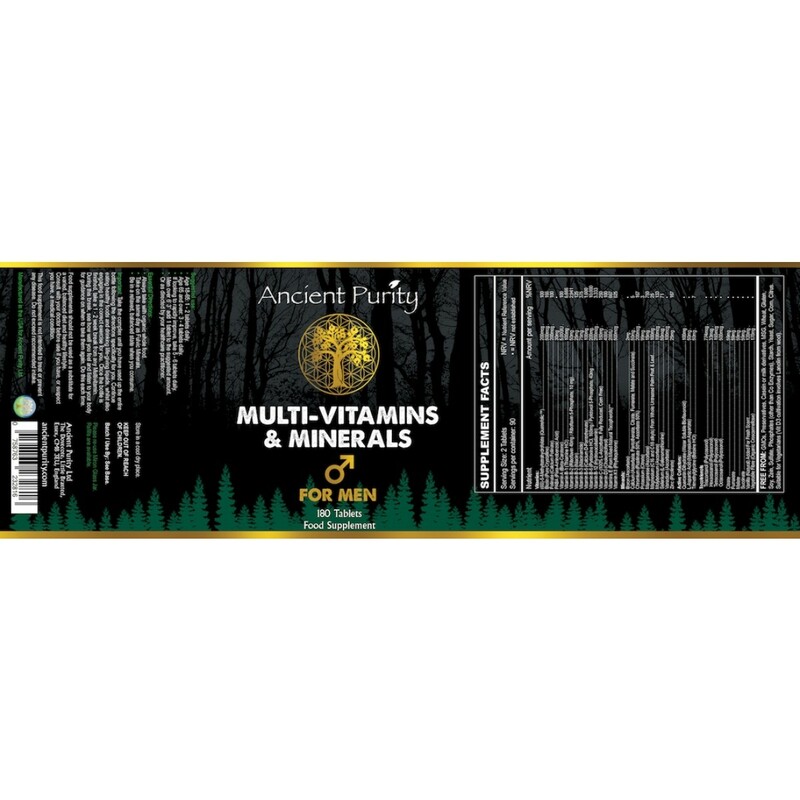 A Premium Multi "Designed For Men"
In the modern world we believe it is essential to incorporate some food supplements into your life along with a healthy lifestyle. It also should be our goal to not just stay alive free from pain, but actually to excel, to go beyond and "Feel" beyond what we can. What could improve in life if we feel our very best, how much more would you like to do if you can live healthy and fit for longer. You can survive on food and clean water and air, but we can also maybe go further by using really good, synergistic food supplements. 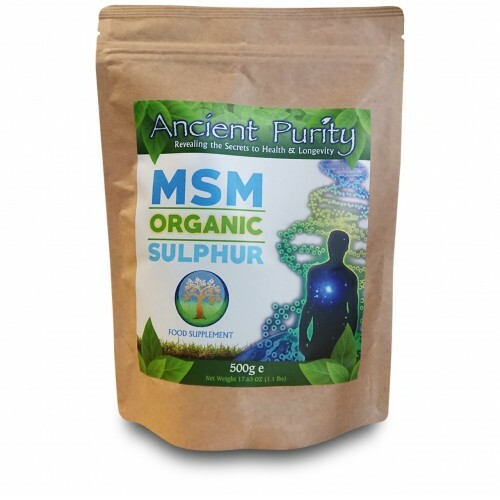 At Ancient Purity we want all people to go beyond what they thought was good health, but we also need to support those who need to make major changes, people need to maybe recover or change their health first and then achieve even more. 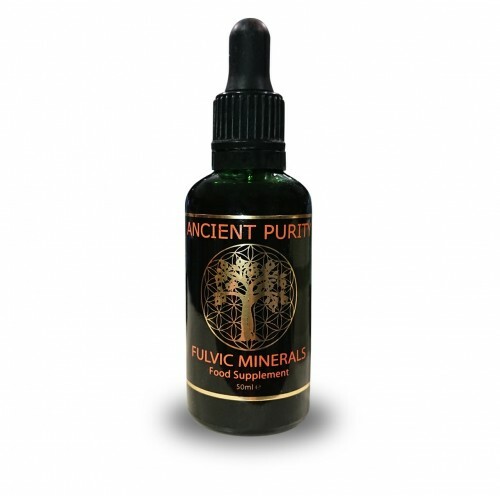 The range at Ancient Purity is big, but there are really specific things for specific people, however, we've always wanted an absolutely incredible, powerful, effective Multi-Vitamin and Minerals, something that contained what years of research and feedback and information has shown us are the essentials. Finally, in 2018 we feel we have the very best Multi there is. It's expensive, it cost a lot to make and there are a few different jobs involved in its creation, but for those on the maintenance of their good health this supplement can last 3 months, and as we will know, the body benefits from breaks. It's also stored in Miron Glass for extra charge and respect to the product. It's all natural and all powerful and we feel essential to life in the modern world. This combination of Vitamins is fully bioavailable, produced for Ancient Purity in the USA following but actually exceeding the FDA’s pharmaceutical GMP (Good Manufacturing Practices) regulations. Let's disclose the Vitamins and the levels of each vital component. Folinate (as calcium folinate) 200mcg. Vitamin B-2 (Riboflavin 40mg / Riboflavin 5′-phosphate, 10 mg) 50mg. Vitamin B-6 (Pyridoxine HCl, 160mg / Pyridoxol 5′-phosphate, 40mg 200mg. 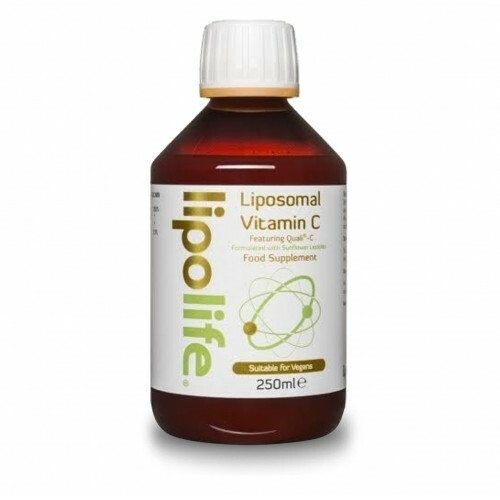 Vitamin C (100% l-ascorbate, fully reduced, corn free) 150mg. Vitamins E (from mixed natural Tocopherols) 200IU. Here we look at the combination of Elemental Minerals, again they are fully bioavailable like the Vitamins presented, combined for Ancient Purity in the USA following but actually exceeding the FDA’s pharmaceutical GMP (Good Manufacturing Practices) regulations. Let's disclose the Elemental Minerals and the levels of each. 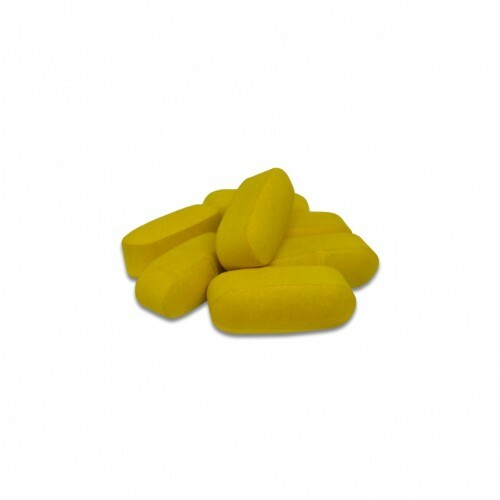 Calcium (as ascorbate, pantothenate, citrate, fumarate, malate and succinate) 50mg. Chromium (as picolinate 50%, ascorbate 50%) 200mcg. Magnesium (as C16 and C18 alkyls) 100mg. The science and creation of this package of nutrients both Mineral and Vitamin also relies on essential cofactors which design the natural healthy state. They are each here for a specific reason and each essential. The cofactors are usable in generating high-energy compounds. So here are the cofactors and the levels of each vital component. Quercetin dihydrate (Water soluble bioflavonoid) 100mg. L-aspartic acid (Magnesium aspartate) 50mg. Tocotrienols are particular components of what we would know as the Vitamin E types. They must be present to get full effect of the other full spectrum contents of what this complex has to offer, so here is whats contained and how much. Necessary components to allow full bio-availability and full effect. The reason for Vanilla is for the freshness of the contents, it is 100% natural therefore free from any nasties which we further confirm at the end. Vegetable fibre (Organic Croscarmellose) 170mg. The collection can be clarified as containing Pure, Hypoallergenic Components has with an Organic base, it is biochemically formulated. There are no inactive unnecessary ingredients and no hidden ingredients. The Vitamins E (listed in the Vitamins section) is stated to confirm that Ancient Purity uses the Alpha, Beta, Gamma and Delta forms of the naturally occurring Tocopherols. The Magnesium as C16 and C18 alkyls (listed in the Minerals section) is from whole untreated palm fruit and leaf. So there are absolutely none of the following: GMO's, Preservatives, Casein or any other milk derivatives, MSG, Wheat, Gluten, Soy, Zein, Sulfate, Phosphates (other than Co Enzymes) Starch, Yeast, Sugar, Corn or Citrus. We follow a process with this life force pack of nutrients. The tablets are created, then stored in glass flower of life containers and finally put into Miron Glass jars ready for use. We do not want to use and heat plastic anywhere near this product, therefore, there is no outside tamper shrink band, inside you will find a tamper-proof cover, if this has been damaged contact Ancient Purity. Vitamins E (from mixed natural tocopherols)** 200IU. Magnesium (as C16 and C18 alkyls†)100mg. Quercetin dihydrate (water-soluble bioflavonoid) 100mg. Aged 18-65 Take 1 - 2 tablets daily. Aged 65 - 100+ Take 3 - 4 tablets daily. For men looking to urgently/dramatically change state Take 5 - 6 tablets daily. Always take with organic whole food. Be in a relaxed balanced state when you consume. Take on the same day as Fulvic Minerals (These should be taken in the morning, apart from any other food or supplement). Important: Take the complex until you have used up the entire bottle following the directions specifically for you, continue with eating healthy foods and life giving liquids, whilst engaging in the correct exercise for you. Take 2 - 4 weeks break from the Complex now, over this time see how you feel and listen to your body to see when to re-introduce them, do this each time you take them. Container: Miron Dark Violet Glass. Q - Theres no shrink band around the top why not? A - We do not want to use and heat plastic anywhere near this product therefor there is no outside tamper shrink band, inside you will find a tamper proof cover, if this has been damaged contact us.